With the movie coming, it seems that a lot of Watchmen related books are coming out. This is one of them. Judging by the number of reviews on Amazon, this book is looking pretty popular. The construct of the book is great. It's hardcover with a dust jacket. The paper stock is good, thick and low gloss. Inside the book are tons of initial sketches, designs, storyboards, comic panels, scripts and scribbles. Dave Gibbons really packed in a lot of stuff from their sketchbooks. The scans are so high in resolution you can see the texture of the sketchbooks' paper grain. 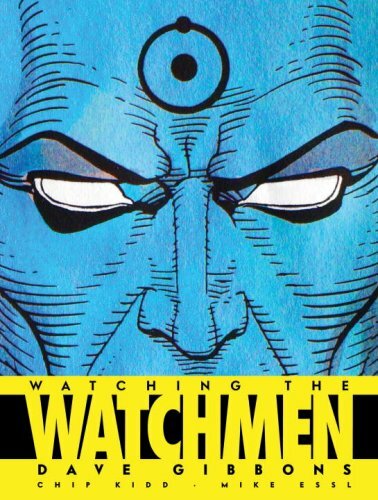 The book starts off with the background story on the history of Watchmen, when Dave Gibbons and Alan Moore first met. Then there's the process of creating the comics, getting the readers reactions (one sent in a fan note using plastic bag), to the sending of the last pages off in an overweight parcel to the publisher. Everything is written in a very condensed manner, the way magazines write their articles. That's not a bad thing though. But for a graphic novel of such caliber, I'm very sure they left out a lot of things. Also, nothing is mentioned about the plot and the character development. I can't believe they actually left out the story about the story, which is what made Watchmen so popular. My reservation about the book is on the perceived lack of depth. Overall, this book is strictly for fans of Watchmen, especially those who have the graphic novel. "Also, nothing is mentioned about the plot and the character development. I can't believe they actually left out the story about the story, which is what made Watchmen so popular." I suspect that is because Alan Moore was, if I recall correctly, not involved with this book. Since Gibbons is involved, but Moore isn't, the books is art-focused and doesn't deal with plot. At least, that's how I understand it. You might enjoy this Mr.
You might enjoy this Mr. Media podcast interview with Dave Gibbons, co-creator and artist of Watchmen, as he discusses the Warner Bros./Fox dispute, being on the set during production, and what he thinks of the trailer and the rough cut he saw of Watchmen. He also talks about the possibility of working with Frank Miller and the message he took to Alan Moore from Will Eisner. Here's the link! Thanks for the information on Business and Self-Motivation Website. Took a glance inside and they seems very good. I love the images on the Art Book you have posted recently. They are so attractive and alluring. Good for you to share them in your blog. Btw, do you draw/design that profile pix showing you? It is very nice. Wonder if you will be interested to doodle something for me in near future..haha..